Almost 30 years ago, a UN emergency panel banned the use of chlorofluorocarbons (CFCs) under the Montreal Protocol. 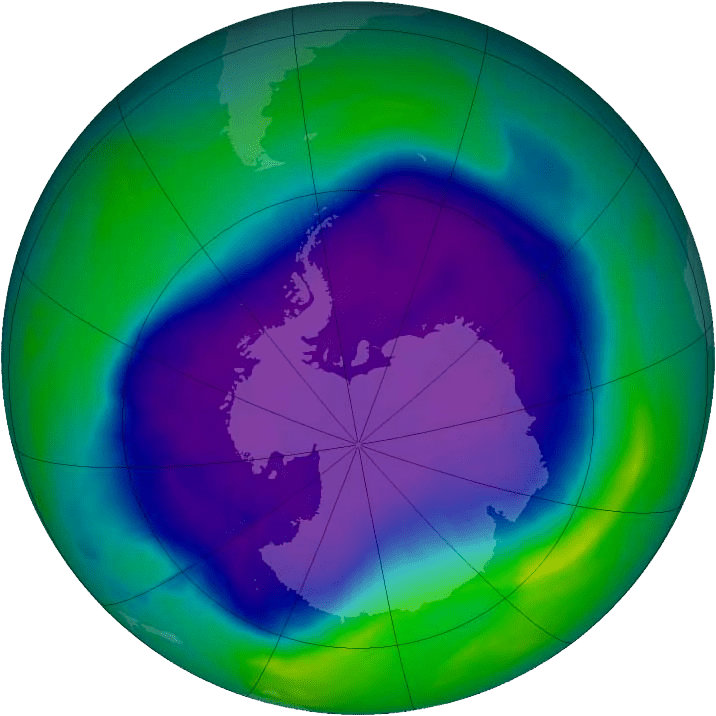 Scientists had learned that these chlorine-containing chemicals had triggered the formation of a gaping hole in the ozone layer right above Antartica. Since then, the ozone layer has clearly recovered, marking a great success — one of the few but highly commendable episodes where nearly all the world’s countries chose to set aside their differences and work for the common good of the planet and all life that call it home. Now, NASA scientists report that they have the first direct evidence that the ozone hole above the icy continent is clearly getting plugged. Susan Strahan and colleagues at NASA’s Goddard Space Flight Center in Greenbelt, Maryland analyzed data from the Microwave Limb Sounder (MLS) aboard the Aura satellite, which has been taking measurements around the globe since 2004. Unlike other satellite instruments that rely on sunlight that bounces off molecules to measure atmospheric trace gases, MLS employs microwaves emissions that can identify and count trace gases even during the dark southern winter. During this season, the stratospheric weather is quieter and temperatures are low and stable. The hole in the ozone layer is getting smaller and smaller. Credit: ECMWF. At ground level, ozone or smog is a poisonous chemical often expelled by vehicle exhaust. High up in the stratosphere, ozone builds up at altitudes between 10 and 50 km where it acts as a shield against the harmful ultraviolet rays, which can cause cancer. Ozone holes occur naturally from cooling, but man-made chemicals greatly accelerate their formation. Chlorine, in particular, is very harmful since these atoms are extremely reactive with ozone. Currently, the ozone hole above Antarctica is the size of North America, which sounds humongous. However, it’s also the smallest it’s been since 1988, according to NASA. After CFCs were banned, scientists eventually observed that the ozone layer started recovering. 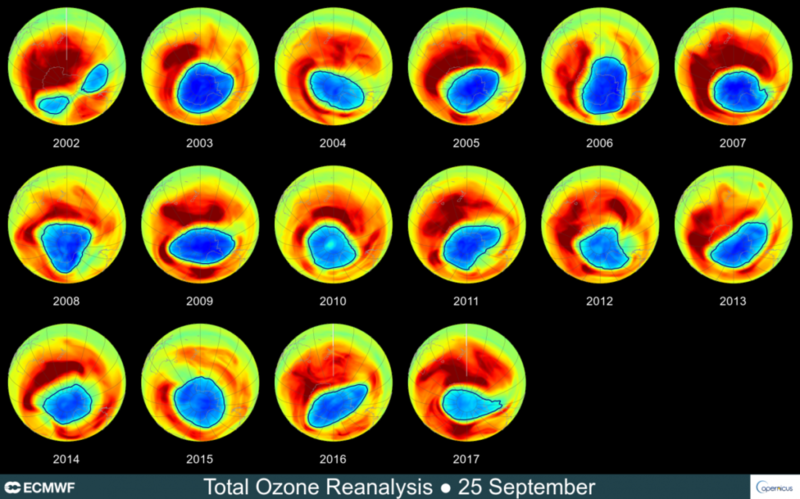 Previously, such research argued that ozone depletion is decreasing based on statistical analyses of changes in the ozone hole’s size. Now, Strahan and colleagues report not only the first direct measurements that prove ozone depletion is decreasing but also that the decrease is caused by fewer CFCs in the atmosphere. The findings are based on yearly MLS measurements conducted between 2005 and 2016. These readings suggest that the ban on CFCs has resulted in about 20 percent less ozone depletion during the Antarctic winter than there was in 2005. On average, chlorine levels are declining by about 0.8 percent annually, the authors reported in the Geophysical Research Letters.